Thomas & Betts Catamount® Extra heavy-duty cable tie in natural color, has strict tolerances to ensure locking strength. 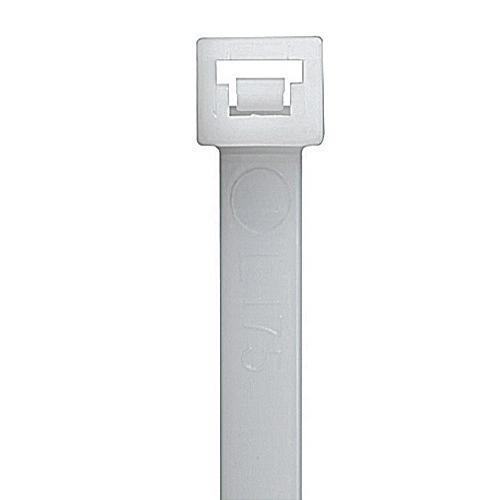 This 0.085-Inch thick tie made of nylon 6/6, has tensile strength of 175 lb. It is suitable for use with wire bundle of diameter 2-3/4 - 10-3/4-Inch. This cable tie has nominal length of 36-inches. It measures 36-Inch x 0.345-Inch. It has reinforced head and strap transition to provide better strength. The highly engineered tooth and pawl design of this tie ensures maximum engagement. It withstands temperature rating of -40 to 185 deg F. This tie is UL 94 V-2 flammability rated to withstand harsh environmental conditions. Cable tie is UL listed, CSA certified, RoHS compliant and meets EN standards.